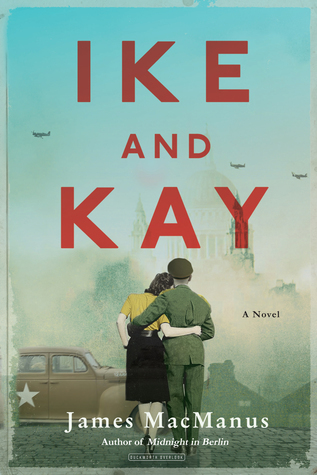 Ike and Kay is a historical novel based on the time that they spent together in Europe during WWII. The author did a tremendous amount of research to write this book and it's apparent despite the fact that there are some historical inaccuracies. (I read an arc so am assuming that these will be cleaned up before the publish date). There is still no definitive answer on whether Ike and Kay had a sexual relationship but MacManus writes the book as if they had - which seems to be the prevailing belief of historians. Amazon affiliate links are used on this site. A free book was provided for an honest answer. In 1942, General Eisenhower lands in London to lead the invasion of Europe and end the Nazi hold on Europe. All visiting generals needed a driver because all of the street signs had been taken down in London in case of an invasion. Kay Summersby, a member of the Motor Transport Corp, becomes General Eisenhower's driver and eventually ends up becoming his chief aide, in charge of his calendar and taking notes at meetings. The gossip begins in the US and Europe over what kind of relationship they really had even as they continue to spend more time together. She not only drives him to meet dignitaries but is often part of the meetings and even has a chance to meet the President of the US when he is in London. The press begins to refer to Kay as "Ike's shadow". She sees a future for them when it's time for him to return to the US after the Allied victory but he has to make big decisions about his future and whether she will be part of it. Overall, I enjoyed this novel. I had read articles about Ike and Kay in the past and this book really humanizes them and helps you understand why some of the decisions that were made happened. High praise to the author for his extensive research on this subject. If you enjoy WWII historical fiction, this is a book that you don't want to miss.